The University of Johannesburg (UJ)’s Centre for Local Economic Development (CENLED), in collaboration with the University of Western Cape (UWC) recently launched the Bachelor of Economics Degree in Local Economic Development at an event held at UWC in Cape Town. The Certified Economic Development Practitioner Programme has been developed in partnership with the International Economic Development Council (IEDC) and in consultation with stakeholders such as the Local Government Sector Education and Training Authority (LGSETA), the Department of Co-operative Governance and Traditional Affairs (CoGTA) and other academic institutions. The programme was developed in order to kick-start the recognition of professionals in the field of local economic development. The programme seeks to unite the field of local economic development and establish a baseline of what is considered the core body of knowledge for local economic development practitioners. This programme was conceptualised and developed by Prof Marius Venter, the Director of CENLED at UJ. 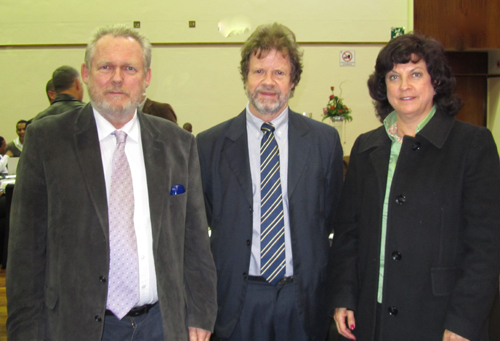 Prof Christopher Tapscott (UWC), Minister Rob Davies (Department of Trade and Industry), and Prof Angina Parekh (UJ). A professional qualification, namely the Bachelor’s Degree in Local Economic Development (LED) has been developed by UWC in partnership with UJ’s CENLED. This is a four-year degree consisting of practical modules that students will be able to apply once they are employed by local authorities, provincial governments, non-governmental organisations, mines or any other institution that wants to improve their local economy. The degree was launched by the Minister of Trade and Industry, Dr Rob Davies, on 29 July 2013, the first intake of 20 students took place during January 2012.The second intake in 2013 was 35 students. These students will apply their skills at municipalities and local authorities during their in-service learning period, which will commence in their fourth year.